After years of development and testing in the open-source community, PyMOL has established itself as a leading software package for customization of 3-D biomolecular images, with more than 600 settings and 20 representations to provide users with precise and powerful control. PyMOL can interpret over 30 different file formats from PDB files to multi-SDF files to volumetric electron density maps. 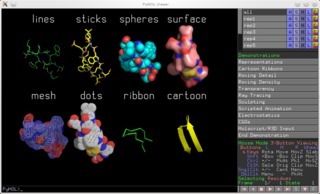 PyMOL's straightforward graphical user interface allows first-time and expert users alike to create stunning 3-D images from their favorite file formats. Images and movies can then be saved in a cross-platform Session file, ensuring that every object position, atom color, molecule representation, molecular state, frame, and movie can be viewed by colleagues exactly as intended. Using PyMOL, data can be represented in nearly 20 different ways. Spheres provides a CPK-like view, surface and mesh provide more volumetric views, lines and sticks put the emphasis on bond connectivity, and ribbon and cartoon are popular representations for identifying secondary structure and topology. PyMOL's quick demo, accessible through the built-in Wizard menu, gets users started with all of the standard representations.